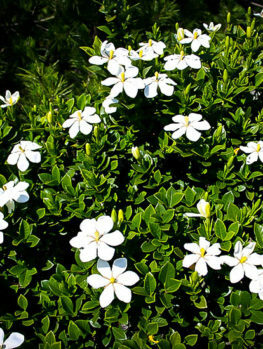 Gardenia jasminoides ‘August Beauty’ – The August Beauty Gardenia is a medium-sized evergreen shrub with rich, glossy foliage and enormous, rose-like pure white blossoms that fill your garden with a wonderful fragrance. 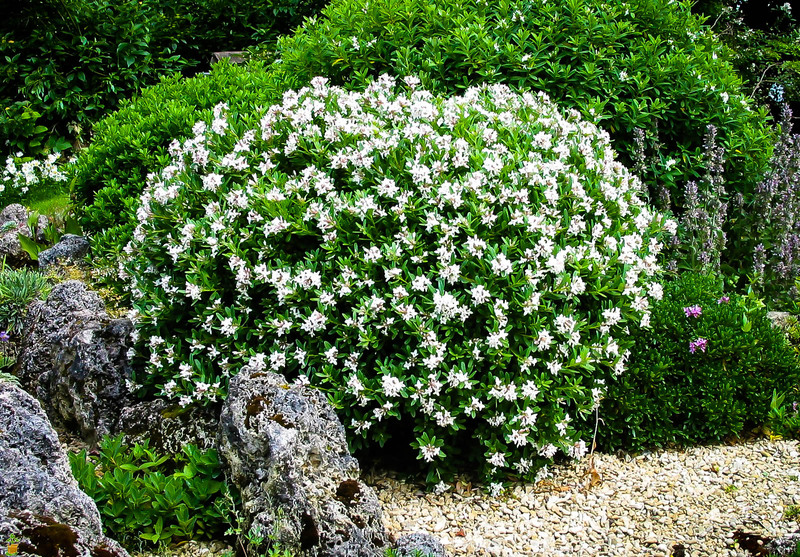 This variety is notable for its continuous blooming from mid-spring to fall, so you can enjoy that addictive fragrance for months and months. This is a vigorous plant growing to 5 feet tall or more, and making a beautiful specimen in the garden, or a lovely hedge. It can be allowed to grow naturally, or clipped into a more formal shape. Even when not in bloom the dark-green, glossy foliage will be a beautiful feature in your garden, and gardenias are not difficult to grow if a little basic care is given them. 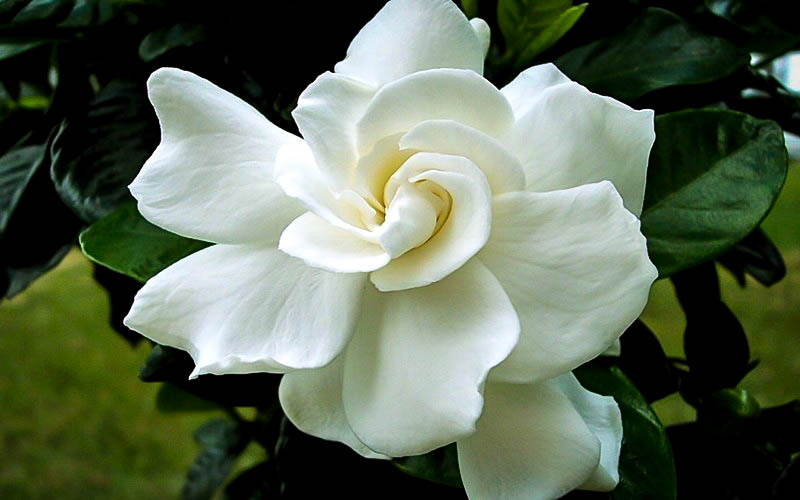 Plant your August Beauty Gardenia is a location that is partially shaded, or has morning sun and afternoon shade. It will grow best in acidic soil, but if you don’t have that you can treat the plant with iron, or grow it in a container. Trim in late summer if necessary, and fertilize in spring. Although not drought tolerant, your plant will normally be free of pests and diseases and it is even unattractive to deer. 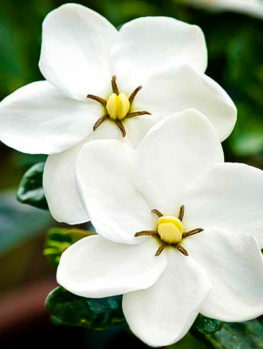 Gardenias are well-known for their rich, exotic perfume. If you live in a warmer part of the country they are easy to grow, becoming beautiful specimen plants that fill the summer air with their wonderful scent. 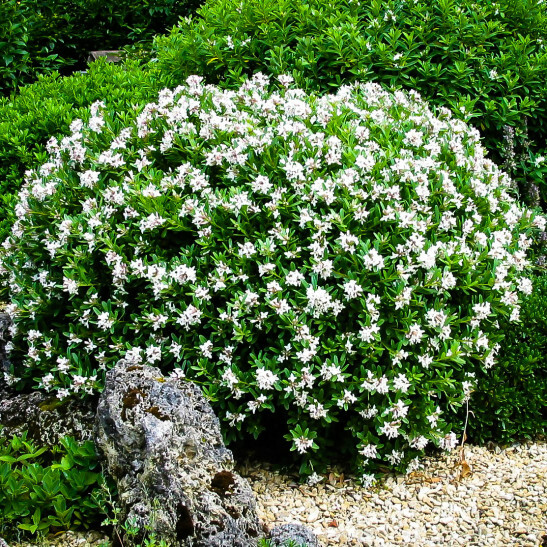 They can also be grown as beautiful low hedges, dividing one part of the garden from another, and keep blooming all summer long, or grown in pots on a terrace or balcony. The August Beauty Gardenia is a classic double-flowered gardenia, with huge flowers a full 3 inches across. There are so many petals of a thick, velvety texture, that the flower resembles a rose. 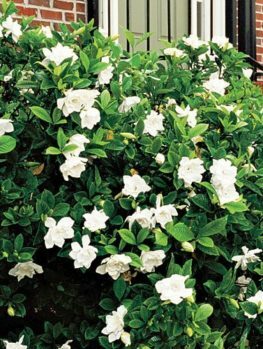 It blooms heavily and continuously from mid-spring to fall and this variety is a great improvement on the common gardenia. Even when not in bloom the August Beauty Gardenia is a lovely plant, with its beautiful, glossy leaves. These are a rich shade of green and are 2 to 4 inches long. The shrub grows to around 5 feet tall if left un-pruned and is upright, spreading no more than 4 feet wide. 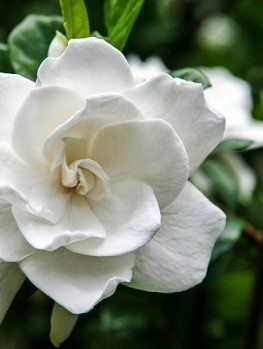 Although they have a reputation for being difficult, gardenias are easy to grow if you create the right conditions and follow a few simple rules. Choose a sheltered spot, away from wind, in a partially shaded location. The ideal spot has morning sun and afternoon shade, especially during the hottest months, so choose the location with care. Gardenias like an acidic soil (pH below 6.0), so test you soil and add plenty of lime-free organic material when preparing the planting spot. Well-rotted pine-bark is ideal, but other composts are also suitable. 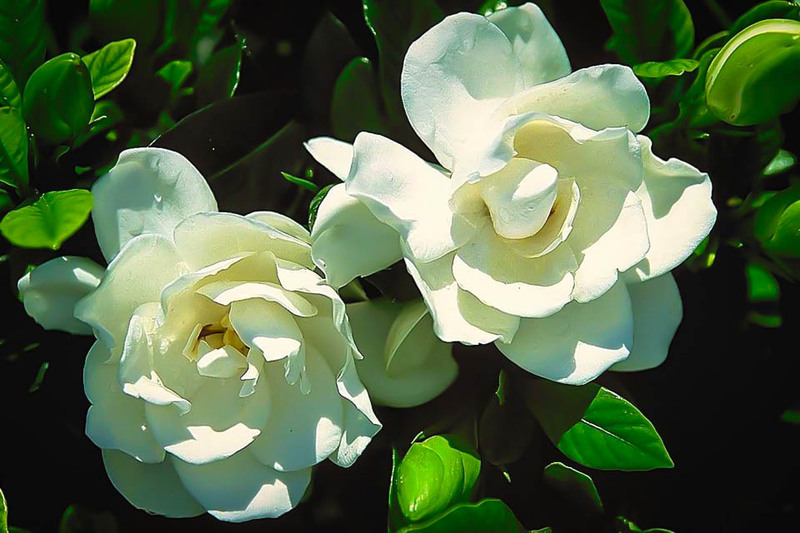 Even if you find your soil is not acidic enough you can still grow the August Beauty Gardenia by using a special fertilizer called chelated iron, which you water onto your plant and soil in spring and again in late summer. This will provide the iron your plant needs to keep the leaves a rich, dark green and to keep it strong, healthy and flowering well. Alternatively, you can choose to plant your gardenia in a container, using potting soil for lime-hating plants. 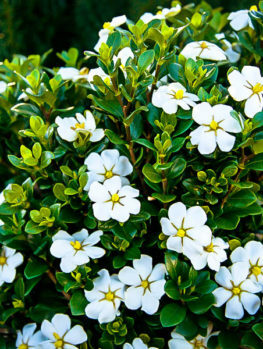 Gardenias make great pot plants, and a plant in a container is also easy to move around to get the correct amount of sun exposure. 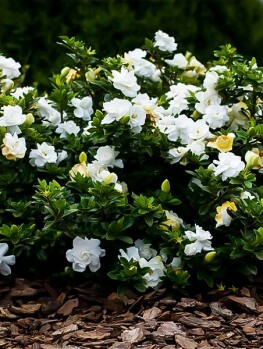 Make sure to mulch your August Beauty Gardenia in spring with pine bark, compost or peat-moss and keep it well-watered. Gardenias like plenty of water, so never let the soil become dry around your plant. Water when the soil is beginning to dry on the surface and don’t water your plant so much that it is constantly in wet soil. 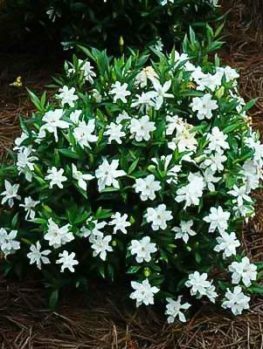 Use a fertilizer for acid-loving plants, applied in early spring and again 6 weeks later, or use a liquid gardenia fertilizer as directed on the packet. Do not fertilize in late summer or fall, as new growth is more susceptible to frost. For a hedge, plant 2 feet apart and clip in late summer after flowering. By pruning at that time you will make sure your hedge has lots of blooms all summer long. Gardenias have been a part of American gardens for over 250 years, since plants were first brought to Charleston, South Carolina from China. Indeed, even their name is American, since the botanist John Ellis had the plant named after his friend and fellow naturalist Dr. Alexander Garden, who had a medical practice in Charleston. The gardenia, or Cape jasmine (Gardenia jasminoides), grows wild from India into Vietnam and southern China to Japan. It has been grown for its fragrance and beauty in China for a thousand years, and was first grown in America in Charleston, South Carolina in 1761. It grew well there and was even grown commercially for corsages. Its popularity meant that it quickly spread across the South and has become a symbol of Southern life. The August Beauty Gardenia is a beautiful and special selection of the ordinary gardenia, so it must be propagated in the correct way to preserve its special characteristics. Our bushes are grown from branch cuttings taken directly from correctly identified plants. That way each one is identical to the original. However, these take longer to produce, so avoid cheaper gardenias that will only be a disappointment. When you smell the delicious perfume pouring from your gardenia bush that little bit of work will seem like nothing. The August Beauty Gardenia is a wonderful plant and we regularly receive new stock to ensure our customers get the best plants. However the demand is high for such a wonderful plant, so order now to avoid finding that the August Beauty Gardenia is ‘sold out’ when you come back. 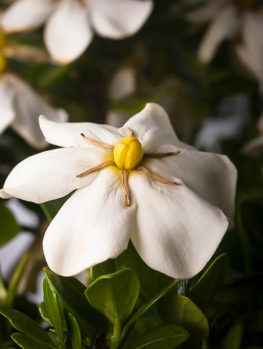 If you like this plant then make sure to browse other popular varieties that we carry, like the ScentAmazing Gardenia and the Frost Proof Gardenia.